Despite another slow start in the second set that saw the Lady Cougars trail 4-0, the home squad ratcheted up its play and forced the first tie of the night at 9-9 thanks to a big kill from Spall. Back-to-back kills from Miranda Hammons (Indianapolis/North Adams-Jerome [Ancilla College]) tied the game again at 12. The Lady Cougars return to action with a road trip at Franklin College on Sep. 29. IU Kokomo returns home to play Anderson University on Oct. 2, with a 7 p.m. start time at Maple Crest Middle School (located across the street from the IUK campus). The match is Breast Cancer Awareness Night and fans are encouraged to wear pink. The first 100 fans will receive a free IUK volleyball pink T-shirt. 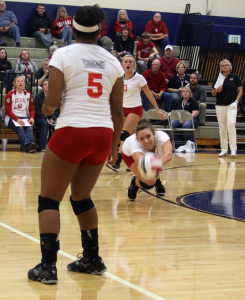 This entry was posted in Cougars, IU Kokomo, IUK, Volleyball. Bookmark the permalink.